Navy Hat: Yard Sale. Sweater: Marshalls. 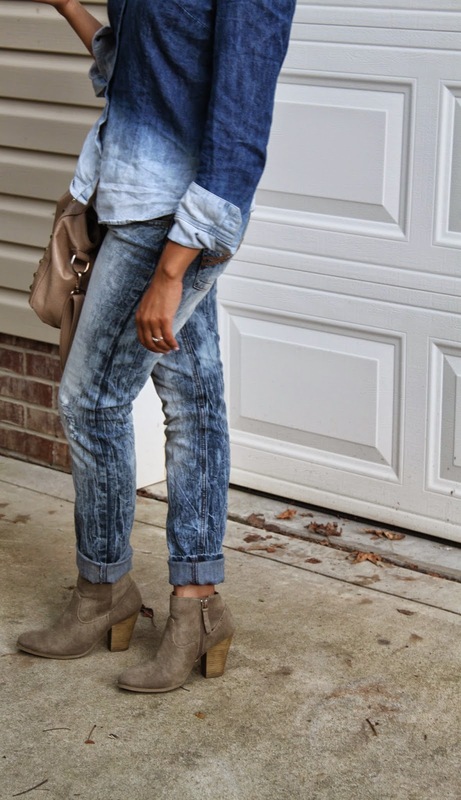 Boyfriend Jeans: Sevens for All Mankind via Clothes Mentor. Caged Booties: Sam Edelman via Belk. Studded Crossbody: Marshalls Necklace: Old Navy. I surprisingly didn't do much Black Friday shopping this year! I did have to run a bunch of errands that day and couldn't resist stepping into Marshalls to see what kind of goodies they had in stock for all the crazies out shopping. I stumbled upon this perfect, leather studded crossbody and I'm so glad I went with my intuition to grab it. Crossbodies have to be my favorite trend this year. Don't get me wrong, I love a big bag but there is just something about the convenience and cuteness of having a little crossbody especially during holiday shopping. Because let's be real- having to carry around tons of shopping bags on top of lugging around a big ole handbag is NO FUN! That's what's so convenient about the crossbody, you just sling it on and you're on your merry way. Perfect! And, what's even more amazing about this Marshalls fabfound is that its identical to this Valentino Studded Mini Crossbody, but I paid a whole lot less!! Try $24.99 for this bad boy. FABULOUS! 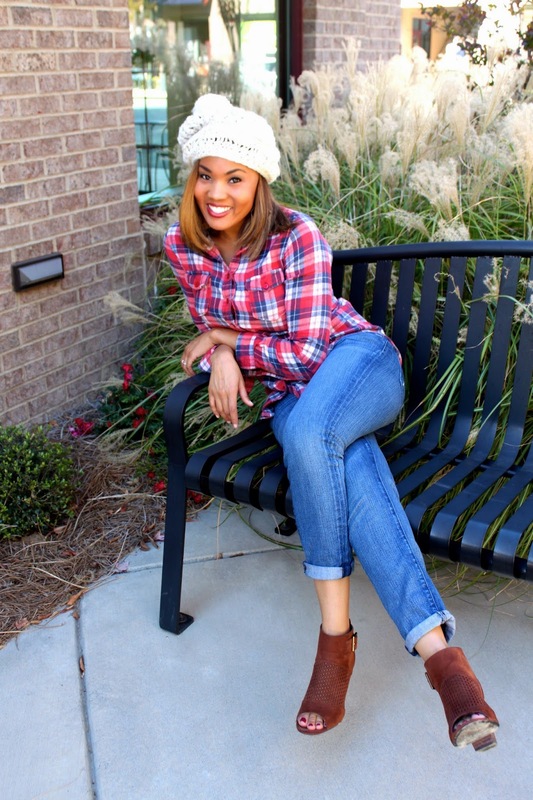 I'm currently obsessed with these creme colored Sam Edelman booties that I scored at Belk. They go with almost everything and the caged texture gives my comfy casual look a little bit of extra edge. Are you a crossbody or big handbag kinda girl? Or both? 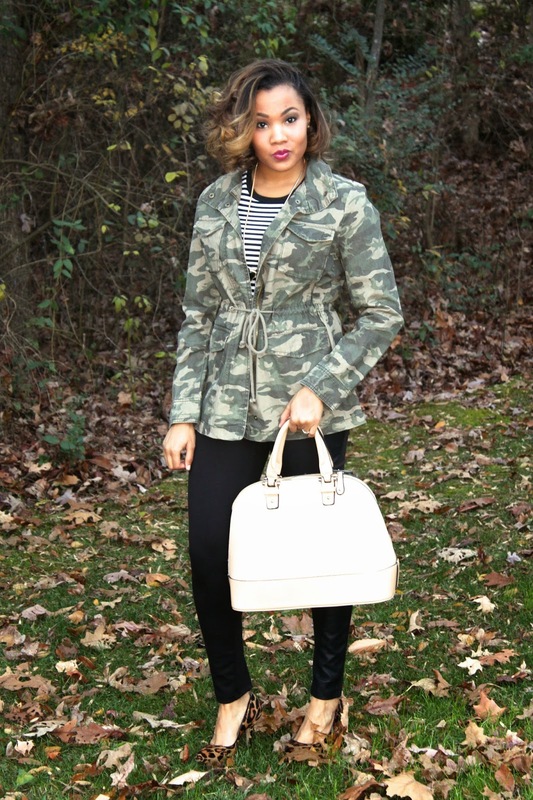 Camouflage Utility Jacket: Old Navy. Black & White Stripped Cotton Tee: Old Navy. Necklace: Old Navy. Black Skinnies w/ Leather Detail: Marshalls. Animal Print Pumps: Nine West. Bag: Marshalls. Hey yall! If you spy something that looks very familiar in today's post then you're spot on. I styled this same black & white stripped cotton tee from Old Navy earlier this week which you can find here. I'm unashamed when it comes to wearing the same piece in a different way. Sometimes all you have to do to create a new outfit is mix up pieces that you already own which is the best because spending money isn't required! I'm a firm believer in mixing up pieces in your wardrobe and really getting your fair wear out of them. Just like I'm getting my fair wear out of this gorgeous bag...sorry not sorry! I just can't get enough. Unlike other fashion bloggers (which if you're like me then you follow aton), I'm unable to afford putting together a brand new outfit with different pieces from high end brands every day. I want people who follow along and read my blog to be able to relate to me and my style and to actually afford it! I love the comfort and fit of this Old Navy black and white stripped basic top. You can easily dress it up or down depending on the look you are going for. When building your wardrobe, I believe that every girl should have the essential skinnies and a pair of animal print pumps. Black skinnies will be your BFF in the fall/winter in that they go with basically everything whether its this super cute Camo utility jacket, a slouchy but chic baggy sweater/poncho and more. Animal print for me is an obvious yes in any case! I'm clearly obsessed. It's edgy and elegant when paired with the right outfit combo. Don't be afraid to wear pieces that you own more than once but in a different way! You'll be surprised what kind of looks you can put together with items that you already own! Black & White Stripped Tee: Old Navy. 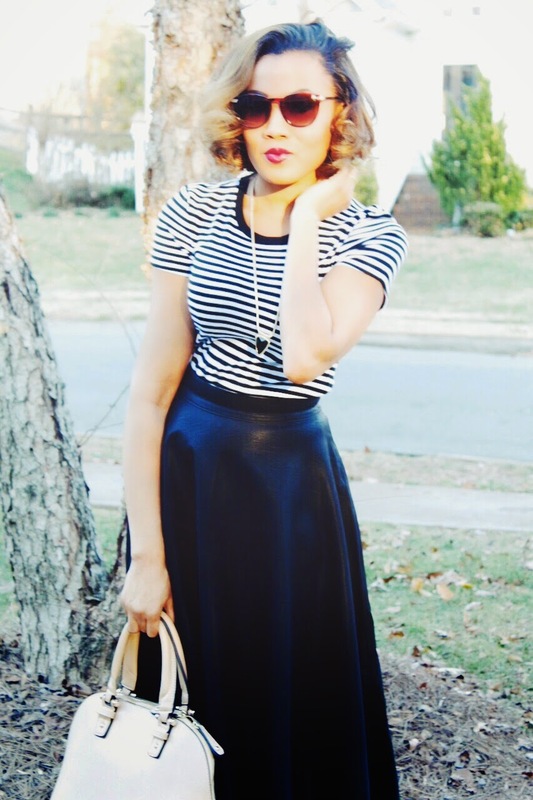 Black Leather Midi Skirt: French Connection- Belk. Gold & Black Necklace: Old Navy. Leopard Print Pumps: Nine West. Handbag: Marshalls. If someone could please tell me how we are already in the month of December that would be great. K thanks! Crazy to think that the year is almost over. It's the most wonderful time of the year! I get so giddy just thinking about the pure joy and magic of the holidays. The music, the shopping (for others of course ;)), the smell of fresh evergreen, and cheer in the air. It's almost more than my little heart can handle before bursting with excitement that Christmas time is finally here. AND, my birthday is right around the corner! December 13th to be exact. I'm accepting any and all forms of love offerings :) With the holidays comes the stress of figuring out what to wear to holiday parties. Us girls will look into a closet full of clothes and claim that we have nothing to wear. Oh, I've been there. Many times. Leather continues to be a chic trend for the winter and holiday season. 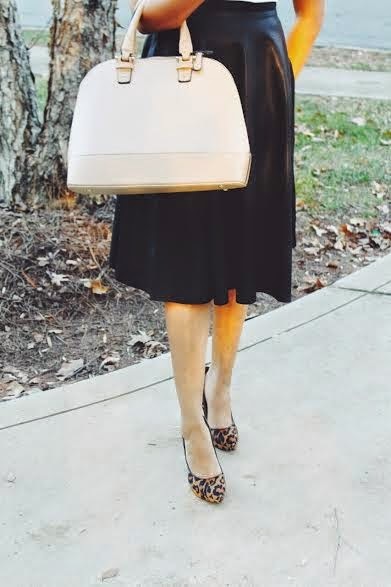 I absolutely love the fit and flare of this French Connection leather midi skirt from Belk. Pattern mixing continues to be one of my favorite ways to really make an outfit pop. 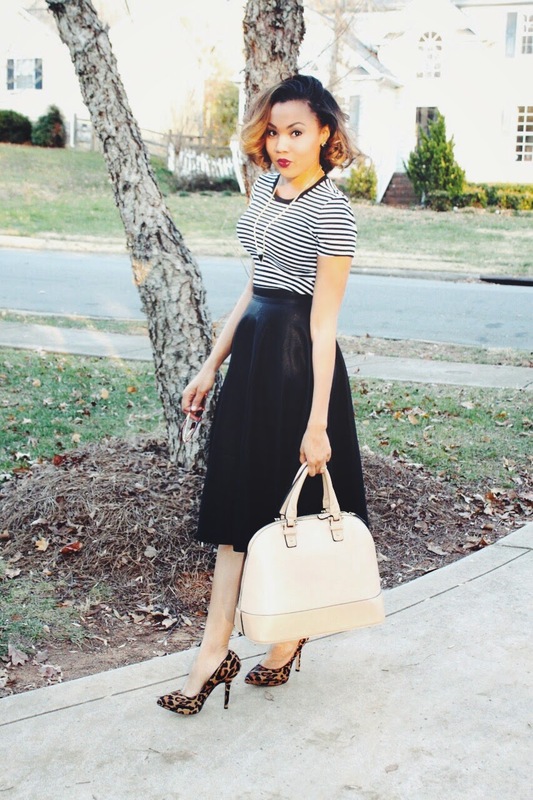 I paired this leather midi with a white and black stripped cotton tee and my new, Nine West leopard printed pumps. Holiday parties don't necessarily mean that you have to wear sparkle from head to toe because not everyone loves sparkle. 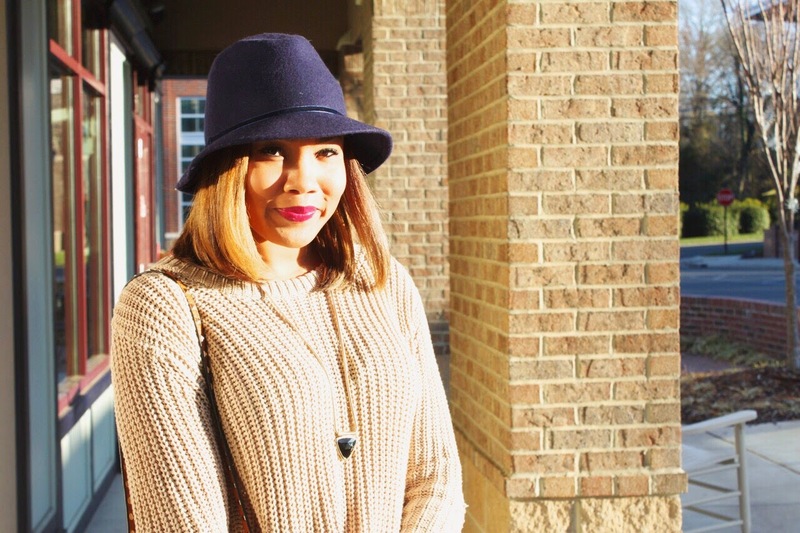 This is a simple yet chic look that could easily go from work wear to holiday party glam. What trends are you guys loving for the holidays? More of YOU Mondays: Patience. That is one quote that will forever be engrained in my mind. I've heard the saying ever since I could remember. Still, somehow I have YET to master the concept that is patience. It's something about myself that I've always wished that I could change. You see- that's the thing. I- me, myself...I can't change a thing. 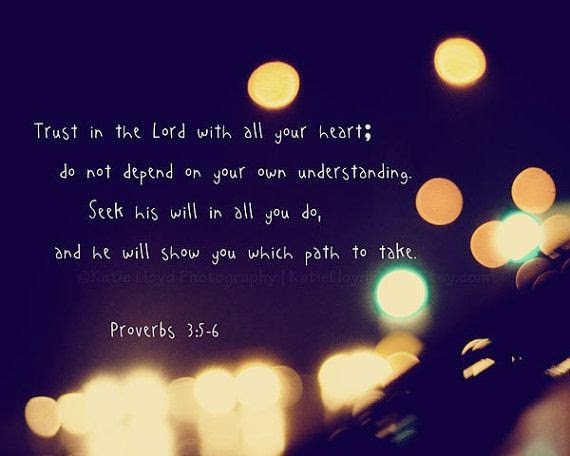 However, I can take the desires of my heart and surrender them to my Father and my Savior and ask him to do just that! To save me from myself, and do a mighty work in my heart. To put my pride aside, and cry out to the Lord telling Him that "I can't do this on my own! I need more of you! I need you to trust and rely on with every breath and with every step of my life." "I've also concluded that whatever God does thats the way its going to be, always. No addition, no subtraction. God's done it and that's it. That's so we'll quit asking questions and simply worship in holy fear. Whatever was, is. Whatever will be, is. That's how it always is with God." 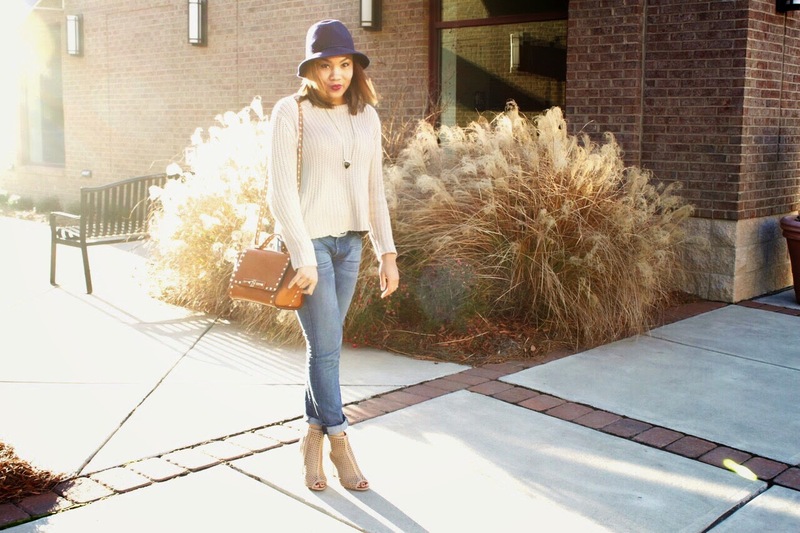 Boyfriend Jeans: Seven Jeans of All Mankind via Clothes Mentor. Suede Booties: Ross Dress for Less. Creme Bag: Marshalls. Plaid Flannel: Marshalls. 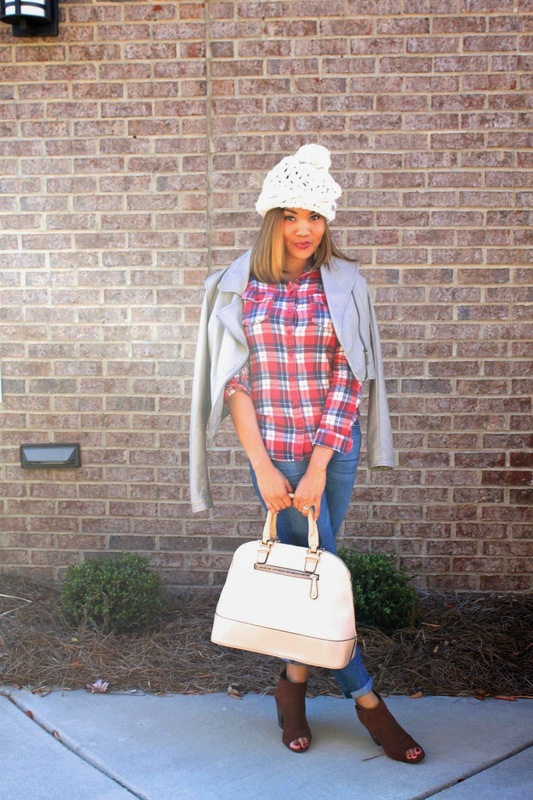 Grey Moto Jacket: Platos Closet. Knit Beanie: Marshalls. I cannot believe that it's already November! This year seriously flew by way too fast. I And can we please talk about how it feels like we completely skipped fall and jumped right into winter without any warning at all! Brrr! That's basically North Carolina weather for ya! 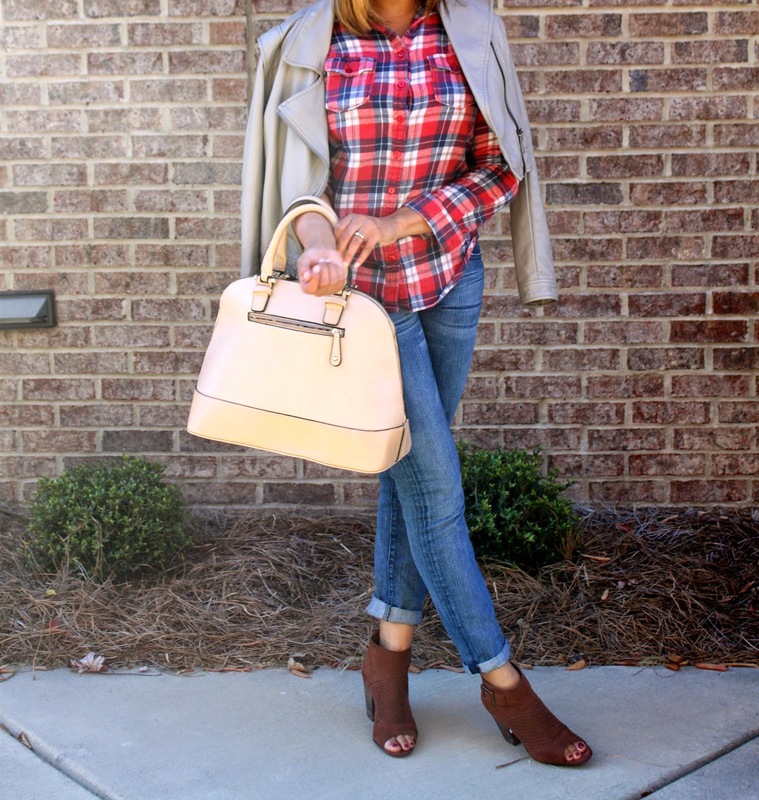 Plaid flannel is easily my favorite go to for both a fall and winter casual look. 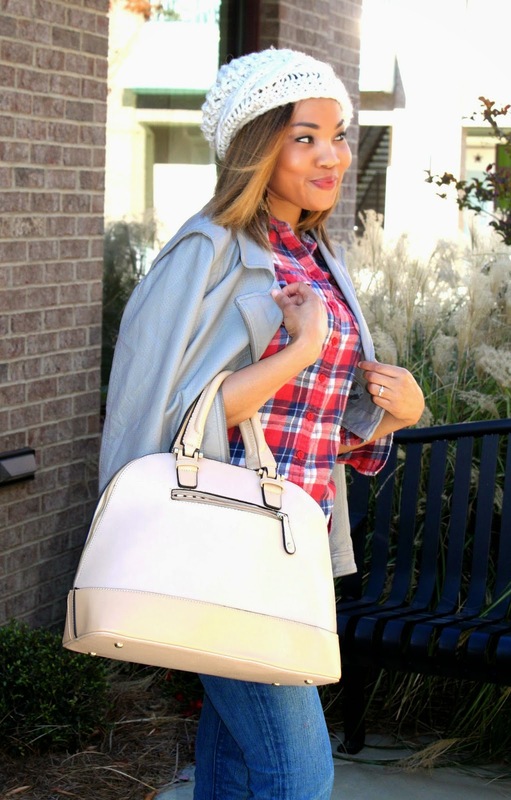 You can go with a fitted plaid flannel top for a more put together, crisp casual fall look or you could also slouch up your look look with a looser, fitting Boyfriend plaid flannel top, a cape, leggings, some tall boots and a cute little beanie. I love the versatility of flannel. I went with the more put together look by pairing my flannel with a little gray moto jacket. Also, my latest obsession has been these Seven Jeans of all Mankind distressed boyfriend jeans that I got for a steal at Clothes Mentor. Floppy, brimmed hats are a huge trend for the fall/winter but the classic, knit beanie will always be one of my favorites. How do you guys style your plaid flannel? I'd love more inspiration! It's been awhile since my last outfit post, but I'm backkk! and with new fall hair! If you follow me on Instagram, you've already seen the new ombre. I'm loving it! I found the most perfect Aztec shift dress, and it only cost be $12.99 so I naturally just had to share with you guys! Ya'll Ross Dress for Less is my jam!! And this cute number has been one of my fall favorites. I'm a huge fan of dresses that can transition from work wear to play. Since there is already a lot going on with the pattern and coloring of the dress itself, I paired it with this simple yet chic army green utility vest and my peep toe brown suede booties which are also from Ross. The army green utility vests and jackets are huge statement piece for the fall and have the ability to dress a look up or down with the right accessories. This outfit has been perfect for the weather which it still hasn't fully transitioned to fall yet here in North Carolina. The days are still quite warm. The dress and vest combo make it fall-tastic and still comfortable enough for the warmer temps. Oh, and let's not forget this perfectly, gorgeous Vegan leather Isabelle bag from Marshalls. I literally died and went to heaven when I laid eyes on it, and aint no way I was about to walk out of the store without it! What styles have you guys been loving this fall? When I first started this blog, I debated back and forth whether or not I would include my faith and beliefs in my weekly post- however, there was no question in my heart that sharing my faith and journey in my relationship with the Lord with you guys would be absolutely necessary. I love clothes, fashion and styling- I could talk about those things all day long, but my faith is the core of who I am and who the Lord is shaping me into daily. Looking back over the past couple of months...going through the valleys- the highs and lows, one thing has remained constant...the presence of the Lord has been with me always. When I had to make what seemed like the toughest decision at the time to let go of a relationship out of obedience to the Lord- His presence was my strength. His presence gave me the words to say, and my heart was sealed with His peace that passes all understanding. Now, does that mean that I haven't had my moments of questioning the decision He gave to me, or being upset, or trying to figure out how my life would play out from that point on? No, it absolutely doesn't. Because I'm human, and my finite mind isn't able to even comprehend the ways of the Lord. The Lord is teaching me through this season that even in the midnight hour, there is still hope. He's teaching me that I, in my flesh am weak, and the enemy is fierce (or thinks he's fierce) and will try to do anything to steal, kill and destroy the faith, hope and confidence that I have in a Father who loves me unconditionally, who is bold, mighty and strong. 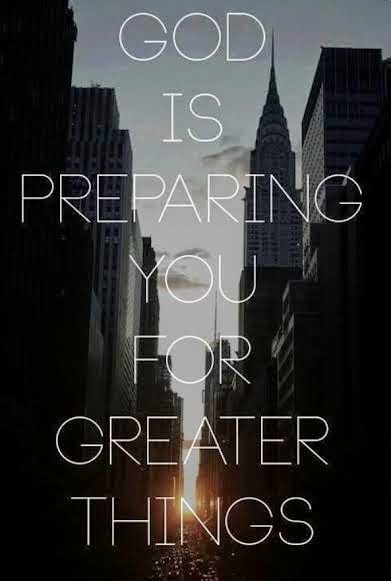 God is preparing me, and preparing you for greater things. Even in the mess, he is still a GOOD God and he knows you better than you even know yourself. Trust in his truth and in His word which is the bread of life and KNOW THAT HE IS GOD. Better days are coming! As believers, and lovers of the Lord we are to still praise Him in the storm, in the deepest valleys just because he is still God. Hold tight to His promises. Take your thoughts captive, and keep your focus on the Lord. 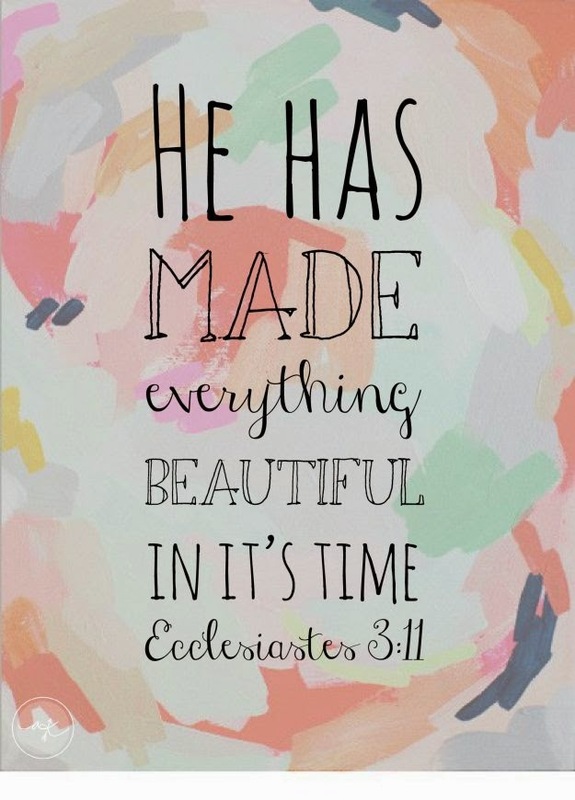 I hope this encourages you to continue to press forward toward greater things that God has planned for you! So thankful for each of these beautiful ladies! Thank you so much for taking time out of your weekend to be a part of this experience. 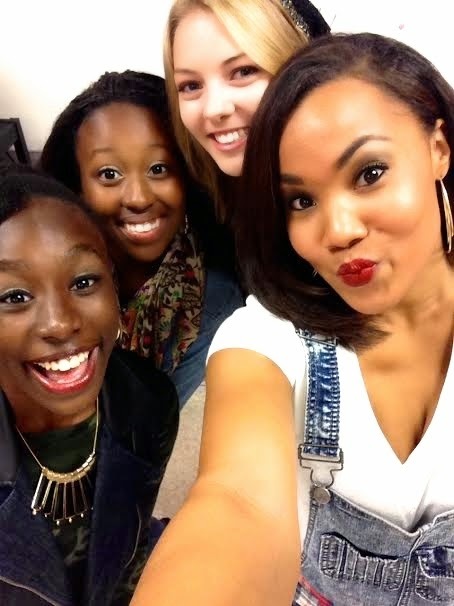 Of course we had to take a selfie!! About a week ago, I had the honor and privilege of coordinating my very first Fashion Show! I would have never thought or even considered taking on such a task, but something within me told me to go for it. After all, my heart and passion lies in styling people and making them look and feel good about themselves. It was the perfect opportunity and I just could not say no. For weeks, I along with a committee of other women planned and prayed over a girls conference that would be run by girls for girls. Cool concept right?! Lynn Cowell, author of Magnetic, Becoming the Girl He Wants, decided that she wanted to create a weekend of fellowship for young high school girls who share a heart for the Lord and for one another. 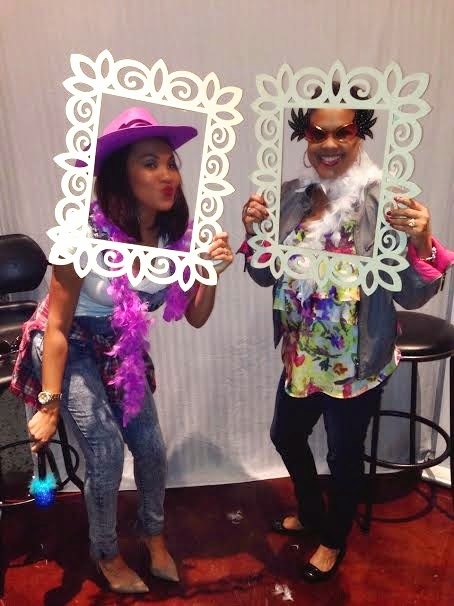 The weekend was full of praise & worship time, Question and Answer with a panel of young women, a Fashion show, arts and crafts and so much more. 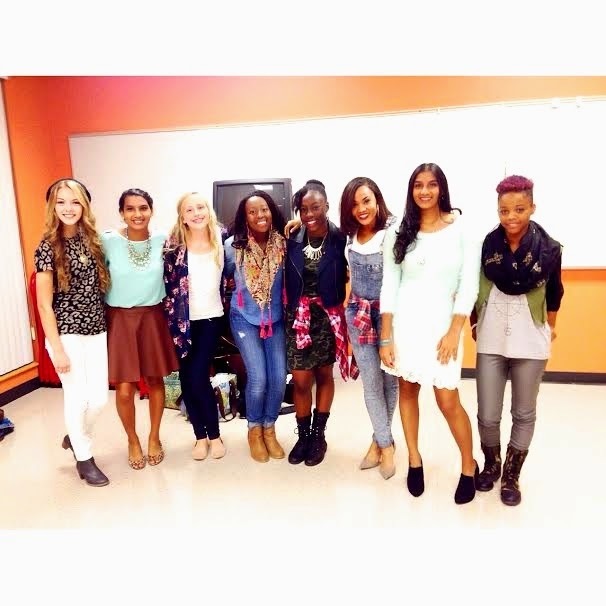 It was such an awesome experience getting to spend time with each of the girls I chose for the show. Each of them had their own distinct personality and sense of style. It was truly a Magnetic Experience. My main focus for the show was this year's fall trends, and each girl represented a different trend. We showcased inspirational ways to rock Camo, Pastels, the Utility Jacket, Animal Print, Leather, Denim on Denim and Floral Print. Don't they all look adorable?! I'm so so thankful for this opportunity and the way that the Lord continues to show me my purpose, and my gifts. He is so faithful. I hope you guys enjoy your weekend! Oxblood Leather Skater Skirt: Five 13 Studio. Fringe Top: Marshalls. Grey Booties: Aldo Shoes. Champagne Studded bag: Ross Dress for Less. It's official like a referee whistle! lol FALL IS HEREEEE!! Hip Hip Hooray! Time to pull out all my chunky sweaters, booties,and my favorite oxblood leather skirt from Five 13 Studio. I also wore this skirt here, but decided to dress it up this time around. These little gray booties are absolutely to die for, and the best thing about them is I got them for a steal last Black Friday at Aldo. You will be seeing them a lot this fall on the blog. Leather pieces are key for edging up your fall wardrobe. I'm on the look out for a black leather midi for work. What I love about about this oxblood leather skirt is that it isn't your plain, black leather skirt. The tone and hue of the oxblood is perfect for fall, and can easily be paired with other neutral fall colors to really set it off. Fall is without a doubt my favorite time of the year, besides Christmas. I've been indulging in lots of Starbucks Pumpkin Spice Lattes and my amazingly, delicious homemade chicken tortilla soup. What have you guys been doing to celebrate the first day of fall?? Last Sunday, I had the honor and opportunity to play creative director and stylist at a friend's engagement photo shoot. Audrina and I have only been friends for a couple of months but it's clear as day that the Lord brought us together. I'm thankful to have another friend in Christ who encourages and uplifts me, and holds me accountable. 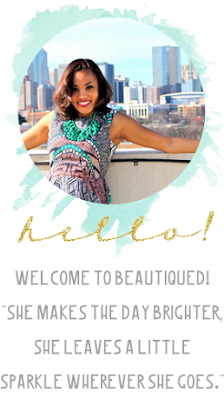 Not only is Audrina absolutely stunning on the outside, but her spirit is welcoming, genuine, warm and contagious. We sat down for brunch a couple of months ago as complete strangers and left feeling like we had been friends for years. The way the Lord brought us together is a testament to His faithfulness because at the time I had been praying for more Godly friends. We had SO many things in common including our love for food and trying new restaurants in the Charlotte area, hiking, fitness, fashion and more with our faith being at the core of it all, and it could not have been more perfect timing. Jonathan and Audrina got engaged a month ago. I was honored to have been apart of the big surprise. He put much thought and careful attention into the night, proposing at the same salsa dance studio they both met at months before. 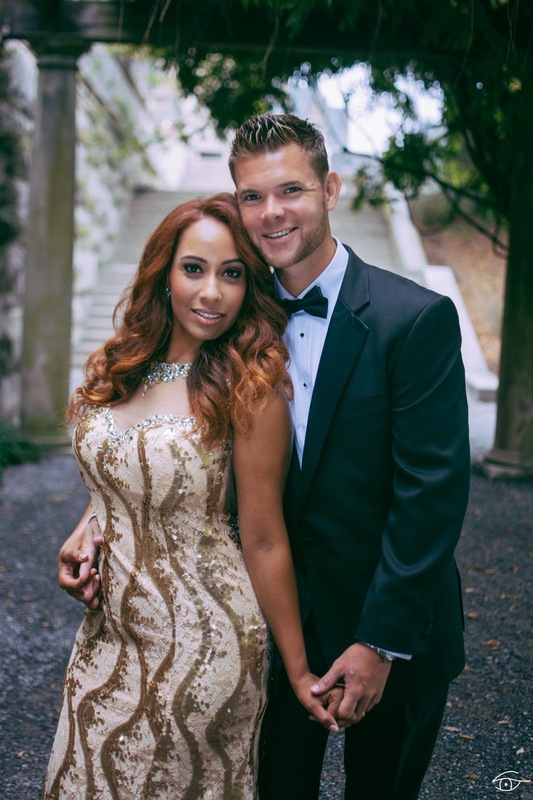 All of Audrina's friends and family from all over flew in to witness Jonathan getting down on one knee. That moment, was the beginning of many special moments that Audrina and Jonathan will share for a lifetime. Sunday morning at the Biltmore Estate was absolutely magical. When Audrina asked me to play her stylist for the shoot yall know I was SO excited!! She told me of how she wanted to incorporate her wedding colors which included soft, blush pinks, and neutral tones and my mind was suddenly overloaded with ideas to really make the pictures come to life, not only with their outfits but with bringing out the love the two share. 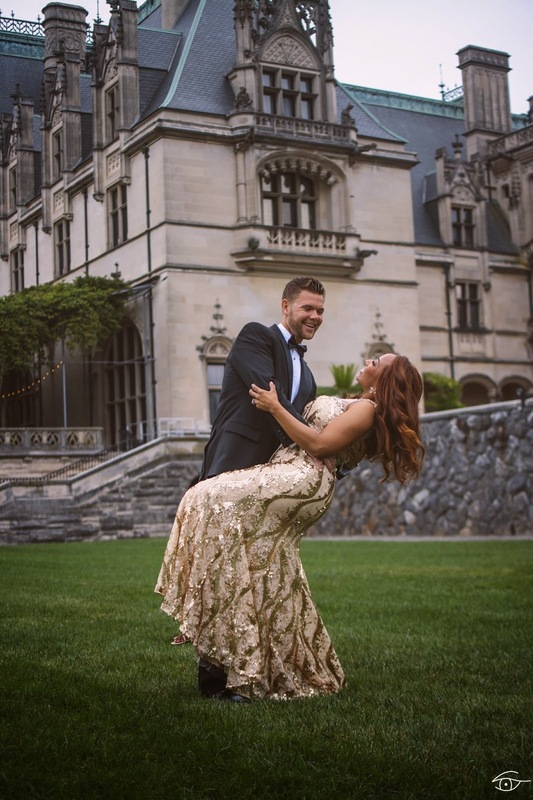 My vision: Blush & Bliss- A Romantic Rendezvous at the Biltmore Estate, and that day was just that and MORE! Aurelius photographed all of these amazing images, and yall when I say this guy is one of the most dopest creatives I've ever met I am not lyin! He is amazing and just an all around gentlemen and nice guy.You can check his work out here. It was great getting to work with him. 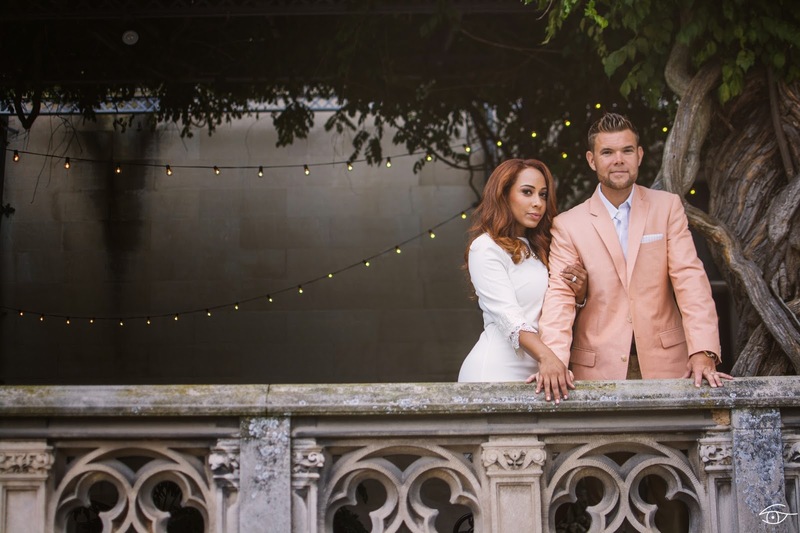 Visitors at the Biltmore all admired Jonathan and Audrina- they were captured by the couples love and also how amazing they looked that day. Thank you Audrina for giving me the opportunity to do what I love the most. Hope you guys enjoy these stunning photographs! Salmon Pink Mens Blazer: Belk. Khaki Pants: Burlington Coat Factory. Mens White Collard Shirt: Michael Kors via Burlington Coat Factory. Creme Lace Dress: Ross Dress for Less. Glitter Peep Toe Pumps: Old via Audrina's Closet. Men's Tuxedo: Burlington Coat Factory. Champagne Glitter Gown: Group USA. 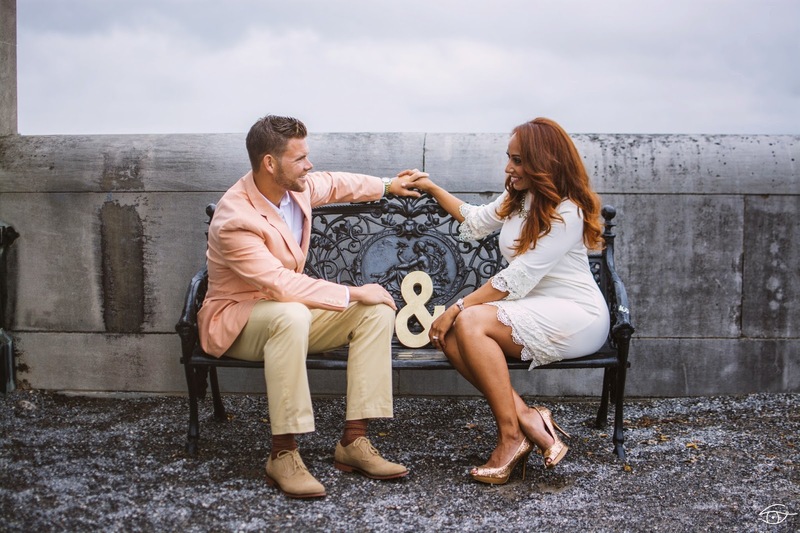 I'd love to style your next engagement photo shoot or special occasion. If you're interested, please email the address underneath my Contact Me tab. Enjoy your Monday! Happy Monday!! I hope everyone enjoyed their weekend! Am I the only one who thinks there should be 4 days in the weekend?! lol one for cleaning, one for going out and having fun, one for running errands and one for rest- ahh that would be absolutely amazing!! But I digress, because let's be real- that aint eva gonna happen. Anyways! I, along with everyone else I know is super excited for the fall season. With fall quickly approaching, there is so much chatter about pumpkin spice lattes, the cool air, the foliage, the fashion...EVERYTHING! Football is back and all of America has fall fever. It's always an exciting feeling when you know a new season is coming. New seasons not only apply to our lives in the physical sense, but they also apply to our lives in the literal sense. Our lives are full of different seasons. Sometimes God is opening doors left and right, other times it feels like he keeps saying no, or slamming the door in your face, there are dry seasons, joyful seasons, and the list goes on. I strongly believe that seasons are purposefully meant to build us up in the Lord and keep us not only on our toes but also on our knees. They keep us rooted in our faith and develop our trust in the Lord. I'm grateful for the seasons. Many times I don't understand why the Lord is taking me to a certain place, or why he tells me no/ or not now but it's my job as a believer to not ask questions and to just trust. Look at seasons of change in your life as exciting moments! Even though things aren't the way you pictured they would be- you don't know what is coming next, and that's the thrill of life! It's mysterious, and you can find joy in every moment knowing that God is always by your side. To be close to the one who does know what's coming next makes the ride peaceful and exhilarating because His plans far outweigh anything you could ever think or ask. Just marinate on that for a little bit. God is good! Trust. Believe.Live. 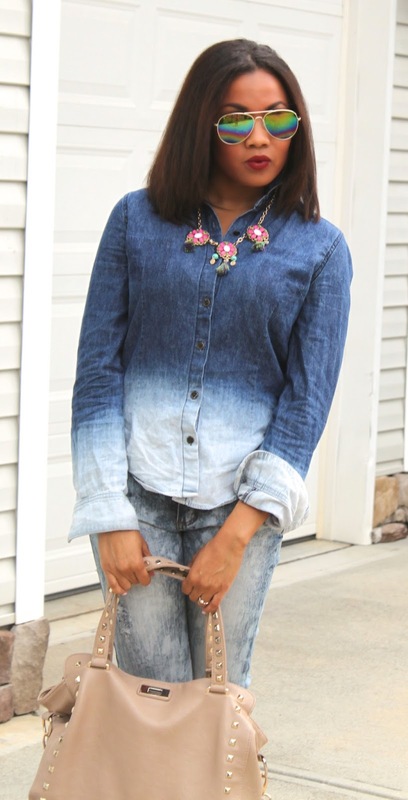 Ombre Denim Top: Platos's Closet. 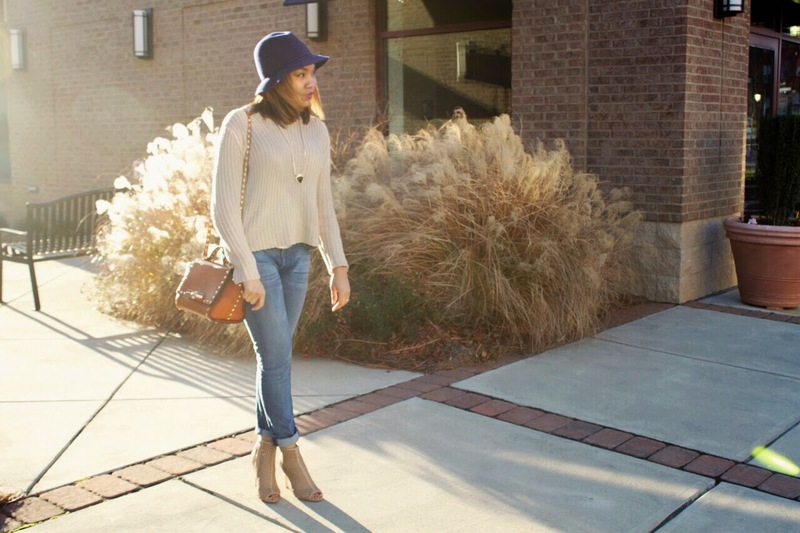 Distressed Denim Pants: Ross Dress for Less. Booties: Platos Closet. Statement Necklace: Versona. Bag: Ross Dress for Less. Hiiii guys!! My apologies for getting ghost on y'all the past week and a half! Work has me completely slammed and I'm still trying to get a good feel of how to balance my blosomming career, personal life, necessary quiet time and the blog all at the same time and it's been quite the task! To be completely honest, most days when I get home from work all I want to do is work out, cook a nice meal and then crash. Andddd I've definitely been doing that the past week and a half. But, I assure you I will be posting a least twice a week on a more regular basis in the future. After all, this is my outlet and my way to share what the Lord has been teaching me (More of YOU Mondays, which you can find here) and also share my love for finding cute pieces and styling them into a unique look. I got the chance to meet with Arlene Goldstein, the VP of forecasting trends at Belk and omg, she is the sweetest lady I've ever met! We chatted about my career, and of course we talked a lot about FASHION! Fall fashion in particular. 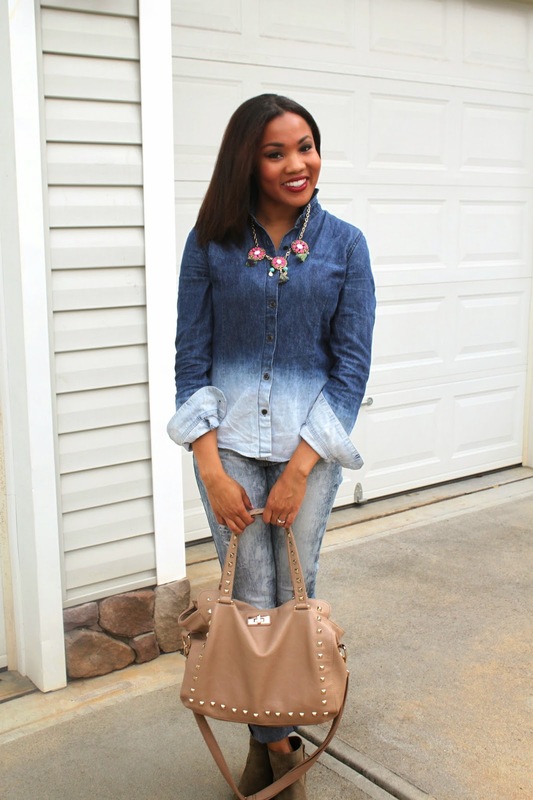 One of my favorite fall trends is definitely the simple, yet chic denim on denim combo. What's so great about the denim trend, is that everyone owns denim so it's a look that you can definitely just walk into your closet and put together without having to worry about going to buy something completely new. You can make your denim pop with a bold shoe, or statement jewelry. I was so excited to bring out my little booties! Which I scored for $12 at Platos Closet. Yes, WIN! You definitely want to have a signature denim pant, booties, and statement jewelry as statement pieces for this fall. Those are a couple of trends that will definitely be popular this fall. Stay tuned for more of my talk with Arlene and what will be trending this fall!